Gizmo is a roaming rabbit, and a member of Mr. Jackson's 4th grade class at Upper Township Elementary School in Marmora, New Jersey. 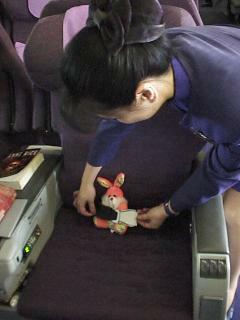 He accompanied us on our trip to the Republic of China, and we were asked to keep a journal of our adventures. We decided to keep an online version also. 1/11/98 SUNDAY - We arrived safely in Taiwan at 7.30 PM after a 6 hour plane ride from NJ to LA and then a 13 hour plane ride from LA to Taiwan. A car met us at the airport and took us to the Howard Plaza Hotel where we are to spend the next six weeks. On the drive to the hotel we saw many bright neon and electric signs written in Chinese. Taiwan is 12-13 hours ahead of New Jersey so although we were very tired when we got there we still woke up very early the next morning because we were still on New Jersey time. 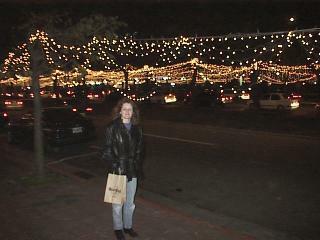 1/12/98 MONDAY - Spent the day exploring the local area, looking for somewhere to buy groceries and take our laundry. Grocery shopping is difficult for us here as they don't have many of the things we buy in America and most of the writing on food packaging is in Chinese. The streets are crowded and the roads are very wide and very busy and very dangerous to cross on foot. Sometimes it's even dangerous to walk on the sidewalk as people drive on them on their scooters. 1/13/98 TUESDAY - Found out a little bit of island history today; it was originally called Ilha Formosa - "beautiful island" by the Portuguese, then later Taiwan - the Chinese word meaning "terraced bay". Taipei is the largest city in the Republic of China and about 3 million people live here. For dinner tonight we ate dim sum (Chinese dumplings) and oolong tea - my favorite! 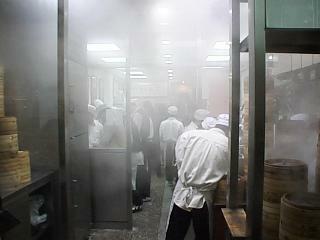 The entrance to the world-famous Din Tai Fung restaurant is through the steamy kitchen and the chefs greet you while frantically making dumplings. The menu is all in Chinese, but they have translation sheets so you can pick what you want. 1/14/98 WEDNESDAY - It was warm this morning (in the 70's) but it has been raining solidly all evening. Taiwan's climate is different from America's, it is subtropical which means it's hot and humid in the summer and mild in the winter. It's wise to always carry an umbrella, just to be safe! 1/15/98 THURSDAY - It's still raining this morning and we've had several power cuts today. But at least the rain seems to have washed away some of the bad smell which is caused by the air pollution. By-the-way, Gizmo recognized the pattern in our hotel carpet as a bridge next to the Chiang Kai-Shek Memorial. We're going to try to find it and get a picture of the real thing. 1/16/98 FRIDAY - Guess what? Today for a change we had some rain. I took some clothes to the laundry today and had a small communication problem as the lady there spoke no English and I speak no Chinese, but in the end I think we did pretty well by miming our questions and answers to each other. 1/17/98 SATURDAY - Today we went to the movies which is an interesting experience in Taiwan. 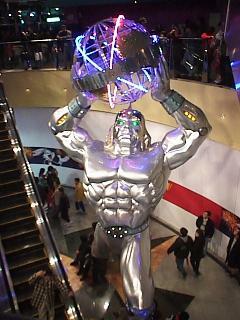 Buying a ticket is the first obstacle, the box office is often located on the street or sometimes inside of a department store. Language is usually a small problem but can be overcome with a little persistence. Once the tickets are bought the next task is to find the theater - they are not usually physically attached to the box office. Sometimes you have to walk a block to find it and last night we had to go up four floors inside a department store to get there. Sometimes even then you'd never recognize the place as a cinema until you got inside the screening room. If there are multiple screening rooms you need to guess which one you should be in because the signs above them and the writing on the tickets are in Chinese. Cokes and popcorn can be purchased and taken in and the seats you sit in are assigned when you buy your tickets. The insides of the theaters are beautifully clean and before the trailers and the movie start they show commercials. English movies are sub-titled in Chinese and sometimes if someone in the movie says a funny line all the Chinese people in the audience laugh a couple of seconds early because they get to read the punchline before it's delivered. If it is really funny and everyone is laughing loud all the English speaking people in the audience miss it because it gets drowned out by all the noise. 1/18/98 SUNDAY - Today we went to the weekend jade market which is about a block from the hotel. The market is held underneath the elevated expressway (bridge). There are hundreds of traders there selling jade jewelry, statuettes, carvings etc. The traders are protected from the bad weather (yes it was raining) by large banners which hang from the sides of the expressway down to the ground acting as a sort of tent. We spent a couple of hours there just walking and looking and had an interesting time. 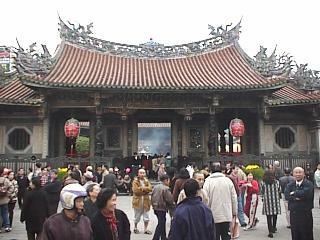 I liked a lot of the religious statues and some of the stalls even had false fingernails made of jade! I wonder what kind of a special occasion you'd wear them to? Opposite the jade market is a flower market which sells plants and flowers grown locally. 1/19/98 MONDAY - A couple more facts: Aboriginal peoples were the first known inhabitants of Taiwan, arriving over 10,000 years ago. Chinese migration from the mainland began around 1400. The official currency of Taiwan is the New Taiwan Dollar (NT$). The exchange rate is about $3.30 (U.S.) to every NT$100 (or NT$33 = $1 US). 1/20/98 TUESDAY - Found Ta-an Forest Park today, within ten minutes walk of the hotel. It's nice to have a park to walk in close by in a city like Taipei. You need to be able to escape the noise of the traffic and crowded sidewalks and spend a few peaceful minutes once in a while and breath in some fresh air! Ta-an has a beautiful pond and an amphitheater. 1/21/98 WEDNESDAY - Tonight we went out with a group of people from work for Chinese 'Hot Pot'. A large pot of boiling water was placed in the middle of the table and all the ingredients were placed on the table for us to cook in the water as we wanted it (a bit like a fondue). The ingredients included beef, lamb, fishballs, tofu, Chinese dumplings, cabbage, cauliflower, spinach, mushrooms, tomatoes, and noodles. The meat was sliced very thinly so it only took about a minute to cook. When your food was ready you took it out with your chopsticks and dipped it a peppery sauce to cool it down and give it flavor. Served with the food was oolong tea and Taiwan Beer. Last night we learned a little about the Chinese custom of toasting. The first toast was a general one with everyone drinking together. Then it's customary to toast the arrival of the food. After this everyone at the table toasts each of the other people at the table starting with the host or hostess toasting the guest of honor (last night the toast was 'Happy New Year'). There was also one special type of toast called gan bei (bottoms up) in which both people are expected to drain their glass. The glass is always held with both hands, with one palm up holding the bottom of the glass. 1/22/98 THURSDAY - More facts: Mandarin Chinese is the official language of Taiwan, but 50% of people speak Taiwanese at home. Taiwan's population currently numbers over 21.5 million, which makes the island one of the world's most densely populated places. Except for the approximately 325,000 aborigines, the people of Taiwan originate from the Chinese mainland. The official method of writing dates in Taiwan is based on the number of years after the establishment of the Republic of China in 1911. They are written year/month/day, so 1/26/98 is written as 87/1/26. 1/23/98 - FRIDAY - Today, we all got called into a meeting at work. We were thanked for our efforts and given candy and a red envelope each. It's a tradition here that just before Chinese New Year, adults give children (and employers give their employees) "red envelopes." Kids' red envelopes contain a few dollars, employees' red envelopes can contain up to 2 month's pay! A new 24 hour 24 screen Warner Brothers movie theater opened up today, several blocks from our hotel. Lines stretched out of the theater, across the courtyard and out to the street. Even late at night its crowded. 1/24/98 - SATURDAY - Not only is driving here terrifying because of the way the cars swerve suddenly and the scooters weave between cars, but some of the taxi drivers have small color TVs on their dashboard. The TVs aren't there for the passengers, the drivers watch them while they drive! 1/25/98 - SUNDAY - We went to the Chiang Kai-Shek memorial and found the bridge depicted in our hotel carpet. We wanted to get a picture of Gizmo posing on the bridge, but he insisted on taking the picture instead. Under the bridge is a big pond filled with huge carp, with several artificial waterfalls pouring into it. 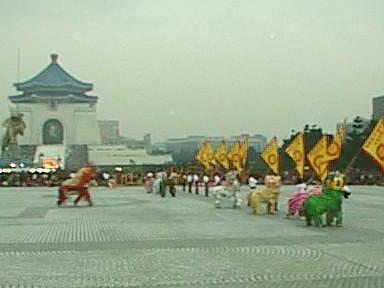 1/26/98 - MONDAY - They've been decorating the city up for Chinese New Year, to welcome in the year of the tiger. The hotel looks pretty with paper lanterns and big coins for prosperity. They've been putting up paper tigers all over the city. 1/27/98 - TUESDAY - It's the day before Chinese New Year, and almost everyone traditionally takes the day off to spend with their family. Looking out the window, the usually-busy city looked like a ghost town. At midnight, firecrackers were set off all over the city and fireworks were launched from the roof of hotels and from the streets. 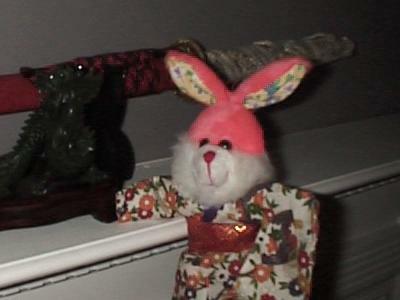 1/28/98 - WEDNESDAY - On the first day of the New Year it's traditional for families to visit the husband's parents' home. Today at the hotel as part of the celebrations, a troop of Chinese circus performers dressed in bright yellow satin costumes, with painted white faces, performed juggling and acrobatic feats for the hotel guests. 1/29/98 - THURSDAY - The streets were still empty and businesses were closed. We've heard that everything starts up again Monday. On the second day of the New Year it's traditional for families to visit the wife's parents' home. 1/30/98 - FRIDAY - Many Chinese people stay at home on the third day of the New Year as it is believed to be a time of bad luck. It's a good day to stay inside and read a good book (at least it keeps you out of trouble). 1/31/98 - SATURDAY - All forms of transportation were packed this weekend as everyone returned home from their New Year vacations. This evening we went to a dinner party in Hsindien, which is a little further into the mountains than we have been before. The party was held on the fourth floor of an apartment building in a residential area outside of Taipei. We took off our shoes at the door and put on slippers for inside the house. Before dinner we drank oolong tea and snacked on pistachio nuts, watermelon and pumpkin seeds. For the main course we were served a veritable feast of fish, pork, and spicy sausage dishes, lamb soup, lotus root, celery with seafood, noodles, rice egg roll, and several vegetable dishes. We were also offered Chinese dumplings, one of these contained a $1NT coin to bring the person who found it good luck for the next year (if they didn't swallow it or break their teeth on it!). For dessert we had 'eight precious ingredients rice pudding' - a cake made of sweet sticky rice with eight types of fruit and candy goodies decorating the top. Then after all this we had more oolong tea and then dragon's eye soup (dragon's eye is a kind of fruit). We finished off this food filled evening with a spot of karoke, a popular pastime in Taiwan. 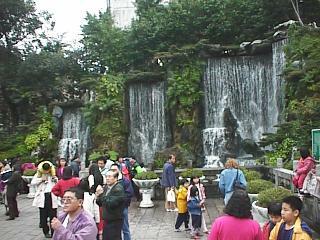 2/1/98 - SUNDAY - Today we visited Lung Shan Temple. 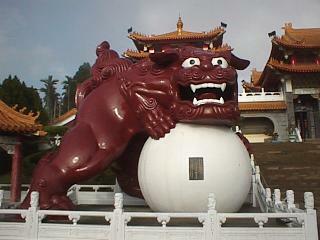 It is 240 years old and is built to honor Taiwan's own gods - Kuan Yin (Goddess of Mercy) and Matsu (Goddess of the Sea). The whole temple is covered with beautifully detailed carvings which are painted in bright blues, reds, greens and yellows. For the New Year the walls surrounding the temple were extended to about 30 feet with solid yellow paper lanterns. Entering the courtyard through an elaborately carved gate led to three beautiful waterfalls on the right, which fall into a large pond full of koi carp, and to the left was a cultivated garden. As this was the last day of the holiday weekend the temple was packed with people paying respect to their gods and ancestors who left offerings of food and candy, lit candles, burned ghost money and incense. The whole temple was very atmospheric with smoke and the smell of incense. Ghost money is money made of yellow tissue paper, that is burned to send it to one's ancestors to spend in the afterlife. 2/2/98 - MONDAY - Today traffic was back to its usual busy self. It was a beautifully clear morning so we could see the city skyline and the mountain ranges beyond them. By afternoon the weather had changed and the mountains had disappeared without a trace. It's weird to see the landscape change so dramatically, imagine what it's like if the first few days you visit the country are overcast, then on the first clear day you get the surprise of your life when a huge mountain appears as if by magic outside your window! 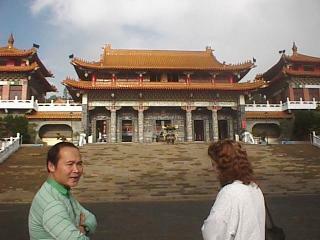 2/3/98 - TUESDAY - As the business center of Taiwan, Taipei probably has the highest concentration of westerners in the country, but those numbers are still small enough that we get the odd stare or surprised look, especially if we travel outside of the city, or away from tourist centers. Young children seem to be amazed by 'western' features and have a tendency to stare wide eyed and open mouthed when they see us, much to the embarrassment of their parents. 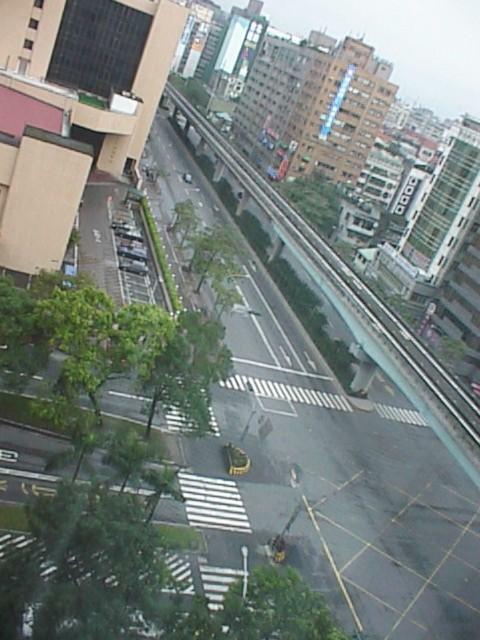 2/4/98 - WEDNESDAY - Taiwan is prone to both earthquakes and typhoons. 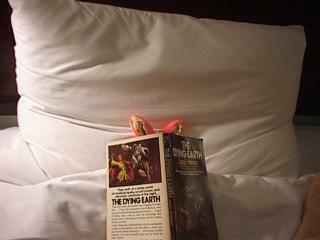 Earth tremors can occur at any time of the year but are mostly so mild they go unnoticed. We've supposedly had tremors since we've been here but we didn't even noticed them. Most of the larger buildings are built to withstand them. Chu-Feng is the Chinese word for typhoon, it means 'from all quarters'. Typhoons are most likely to hit Taiwan from July to October. 2/5/98 - THURSDAY - We heard some terrible news today. Apparently, 2 years ago the mayor of Taipei declared video, pinball and pachinko arcades ILLEGAL in the city! He gave the owners several days to comply, then confiscated and destroyed thousands of machines. We suddenly feel a long way from home. 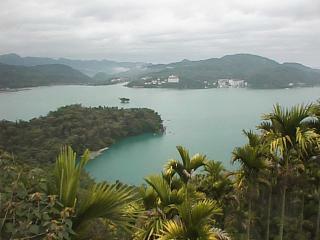 2/6-2/8 - FRIDAY-SUNDAY - We went to Sun Moon Lake for the weekend. Sun Moon Lake is in the middle of the island and is actually 2 lakes, a round one (Sun) and a crescent one (Moon) separated by an island. 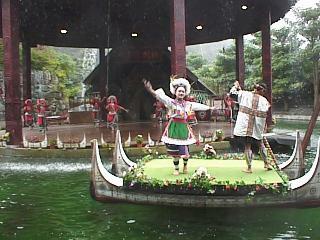 On Saturday, we went to the Formosan Aboriginal Culture Village. The Aborigines are 9 tribes of people that were here when the Chinese arrived from the mainland. We saw native folk dances and the types of homes they had. Actually, they still live in similar bamboo and slate houses but now with electricity, plumbing and TVs. 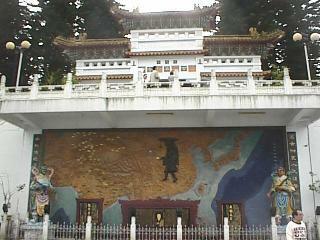 Then we went to a Taoist temple. 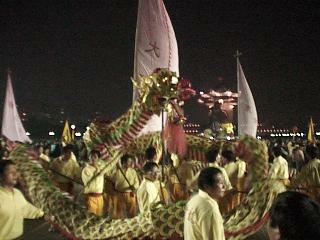 People were lighting bundles of incense and praying to the many Taiwanese gods. They believe that there are 4 types of gods: legendary (like the Dragons), natural (like the spirit of mountains), great people (like Confucius) and everyone's ancestors. Sunday, we went to a Buddhist temple dedicated to Hsuan Tsang, the monk that walked to India and back (over 17 years) to bring hundreds of religious scrolls back to China. 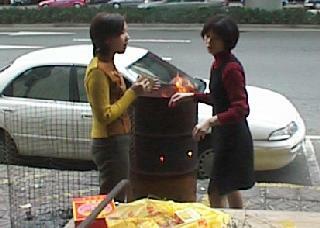 On our way back up to Taipei, we stopped and bought roasted sugar cane from a street vendor. Sugar cane looks like bamboo and they hack off a one foot section, put it on coals, then cut the outside off and hand it to you hot. You bite off a piece and chew the fibers, freeing the sugar syrup. It was really good but you can practically feel the cavities forming. 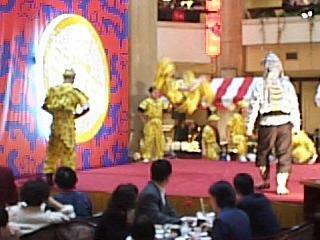 2/9/98 - MONDAY - In the week leading up to the Taipei Lantern Festival the whole city is being decorated in preparation. It seems anywhere a lantern or string of lights can be hung there is one; including in local parks, monuments, hotels and stores. Jen Ai Road which houses our hotel is smothered with thousands upon thousands of white lights which are strung in the trees which line it on both sides and run down the middle of it. At night they make a spectacular sight and look as if a giant spider has spent days spinning a web amongst them! 2/10/98 - TUESDAY - In Taiwan there are many ways a homesick American can get a taste of the States including the Hard Rock Cafe, Planet Hollywood, Ruby Tuesdays, McDonalds, Wendys, Burger King, Pizza Hut, and Dominoes. You can stay in a Holiday Inn, or shop at the local 7-eleven (sorry no WaWa's!). There are several American clubs where you can meet and make friends with people from home, and if you're in Taiwan with your family for an extended period you can even send your children to an American school. 2/11/98 - WEDNESDAY - Today marked the beginning of a three day holiday known as the Lantern Festival, which marks the end of the Chinese New Year celebrations. According to legend, at this time the celestial spirits could be seen by the light of the first moon, so torches were lit to improve visibility. 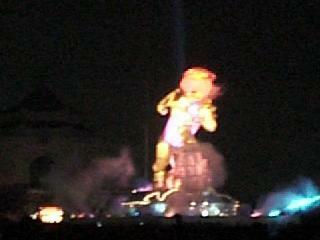 Lantern making and the celebration of this festival developed as a result. 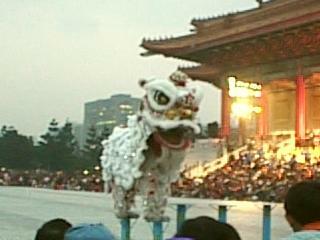 Many local temples display lanterns at this time of year but by far the biggest and best is held at Chaing Kai-Shek Memorial Hall which displayed thousands of lanterns and held many performances including puppet shows, aboriginal dancing, live music, lion and dragon dancing. The highlight of the evening was when the lights dimmed and the theme lantern (a giant tiger with wings) was lit in the center of the square to the accompaniment of music and a laser show. 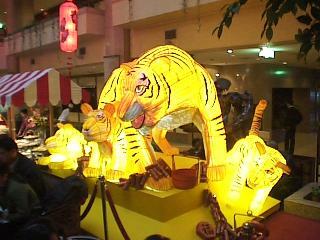 All the children were given hand held tiger lanterns which they seemed to enjoy. The whole area was packed solid with people for three days, making it difficult to drive or walk anywhere nearby while the celebrations were going on and for sometime afterwards while people were making their way home. 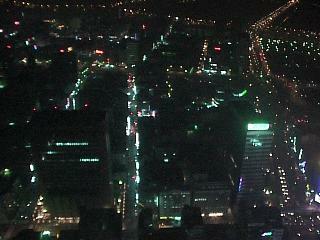 2/12/98 - THURSDAY - Tonight we went to dinner at Shin Kong Life Tower, the highest building in Taipei. The tower has fifty one stories above ground, and seven stories below. The 46th floor houses an observatory which allows a 360 degree view of the Taipei basin (valley). The tower has a super fast elevator which takes you from the ground floor to the 46th in 30 seconds - so fast it makes your ears pop! 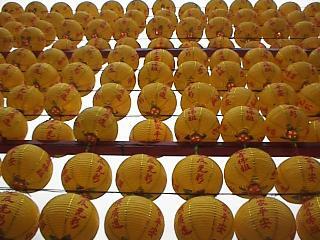 2/13/98 - FRIDAY - Today is the last official day of the Lantern Festival. The city will look bare tomorrow when all the lights and lanterns are put away for another year, a bit like the day when the Christmas decorations come down at home. 2/14/98 - SATURDAY - Today is Valentine's Day, although it's not traditionally celebrated in Taiwan (they have their own version called Sweetheart's Day in September). 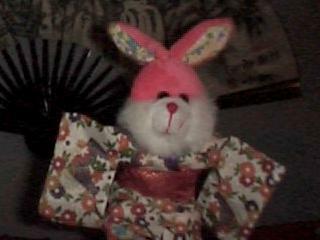 Still, many people seemed to be getting into the spirit with cards, flowers, and candy for their loved ones. We went to a Valentine's Day dinner at a nice restaurant. 2/15/98 - SUNDAY - Like their counterparts around the world, the children here enjoy cartoons. One popular character (and Gizmo's favorite) is a Japanese cartoon called 'Bad Badtz-Maru' - he is a naughty penguin with attitude, the baddest little bird around. Those who know him say don't mess with him when he has a 'bad feather day'! 2/17/98 - TUESDAY - The whole country was saddened today by the news of a plane crash at Taipei International Airport yesterday where many people lost their lives. 2/18/98 - WEDNESDAY - Some Westerners believe that thirteen is an unlucky number, here in Taiwan the same is believed of the number four. If you take the elevator in a hotel, a department store, or any tall building there is likely to be no fourth floor (they are labeled 1,2,3,5,6,7,etc.). Our hotel has both a fourth floor and a thirteenth, (although it is only labeled "T"). 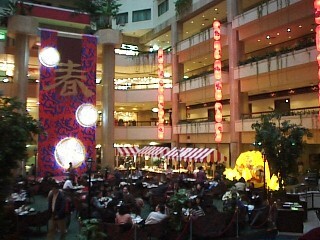 2/19/98 - THURSDAY - Taiwan has many large department stores, some of which have over ten floors or more. Although they are similar to those at home, in some ways they are different. One difference is that at certain times of day there are ladies who stand at the entrance to bow and welcome every person who comes into the store. There are also ladies who operate the elevators for you. Most signs and announcements are in Chinese, Japanese and English. Many of these stores have a food court and supermarket at basement levels. When you decide what you want to buy, a floor person from that department will note it down by hand onto a pad and then take your money to a counter where another person works the cash register and bags the item. This is given back to the floor person along with your change and receipt who then brings it back to you. If you have several things from different departments, the floor person will visit each of them to note down the various items before they are finally rung up on one cash register. If you commit the faux pas of taking your own shopping to the registers, they won't deal directly with you and will frantically call over one of the floor people. Convenience stores here also have some differences than their American counterparts. The drinks they sell include many types of iced tea (made with green tea) and lots of iced coffee. Soda machines sell wheat sodas, sodas that taste like peanut butter flavor, sarsaparilla, papaya milk and Gatorade-type drinks. Snacks include dried sweet meats (a bit like jerky), Chinese dumplings, and one delicacy I've noticed lately (but not been brave enough to try!) is chicken eggs boiled in tea. They also eat various roasted seeds including watermelon and pumpkin. 2/20/98 - FRIDAY - Earlier this month, we visited an amusement park. They had a cruise featuring animated dinosaurs (not quite as good as Disneyworld), regular carnival rides and a big Batman-style rollercoaster. Yes, we rode it, but they wouldn't let Gizmo on because he was shorter than the this-tall-to-ride kangaroo. Inside, they had a really cool Lego exhibit. 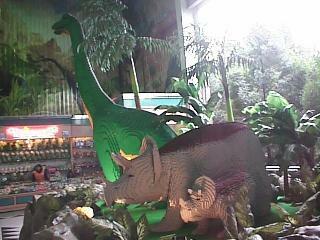 It included several big dinosaurs built entirely of Legos! 2/21/98 - SATURDAY - One animal you see quite a lot in Taipei is the dog, though you rarely see them being walked on leashes by their owners (though I have seen a couple riding on scooters and one wearing a coat and booties!). Most of them seem to be strays. They sleep outside of stores and garages, sheltering from the elements wherever they can, but they don't really bother anyone, only venturing out when it's time for exercise or food. I've seen a couple of these dogs going off on a walkabout, and as I've mentioned before Taipei is a big busy city, but these dogs are smart and when they get to a road they stop, wait until a person comes along and then cross over with them. 2/22/98 - SUNDAY - Tonight, we went to a wild restaurant called the "Indian." 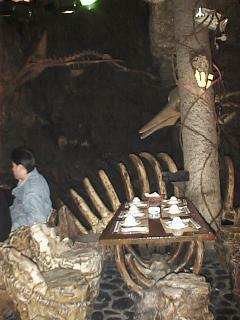 It was huge, designed like the inside of a cave and filled with dinosaur skeletons hulking over the chairs or suspended from the ceilings. 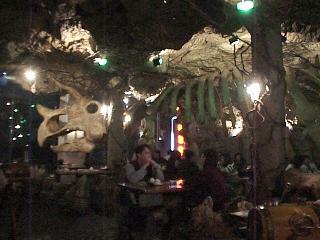 The menus showed Native Americans riding T-Rex's and the tables and chairs looked like something out of the Flintstones. They served conventional snacks as well as frog legs, duck tongues, and fried crickets. Yum! We tried the duck tongues. Apparently, it's an acquired taste. 2/23/98 - MONDAY - Well, it's been a quick 6 weeks and it's already time to come back to America. We're ready to return and even Gizmo is getting a little homesick. Spent the day doing some last minute shopping and having one last look around. 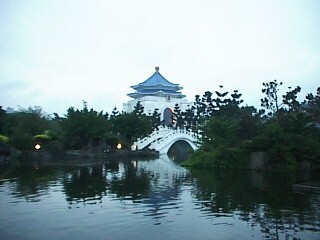 2/24/98 - TUESDAY - After a ten hour flight from Taipei and an hour bus ride from Los Angeles, we arrived exhausted at the Disneyland Hotel, several hours before we left (thanks to the international date line). Gizmo was eager to get straight over to the park but we decided that it was best all round if we stopped at the room for a quick nap first. Five hours later (ten minutes after the park had closed) we woke up. After getting something to eat and a little exploring of the hotel and its surroundings we retired, deciding to hit the park first thing tomorrow. 2/25/98 - WEDNESDAY - Today we went to Disneyland! After breakfast with Goofy, Pluto and some of the rest of the gang we finally arrived at the park. We had a great day going on our favorite rides including Mr. Toad's Wild Ride, Haunted Mansion, Splash Mountain, and Star Tours. The highlight of my day was seeing Mickey and going on the Indiana Jones ride (our new favorite). The highlight of Bill's day happened when we happened upon about twenty pinball machines outside Space Mountain. They included many new ones like X-Files, Starship Troopers, Medieval Madness and (my favorite) Attack from Mars. 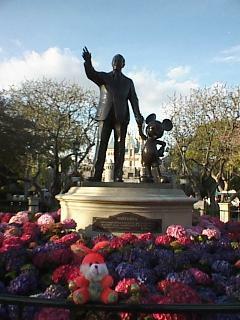 Gizmo enjoyed the whole day but said the Roger Rabbit Ride in Toon Town was the most fun. 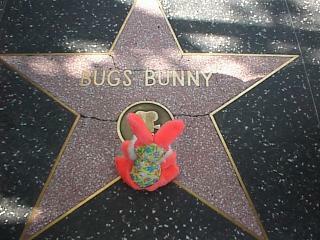 2/26/98 - THURSDAY - Today we went to Universal Studios for another great day full of fun and exciting rides. Our favorite by far was Jurassic Park. 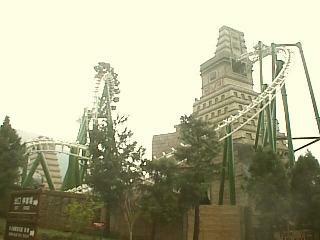 We went on 5 times and each time we got a little wetter and a little braver. Gizmo spent the day defending us against King Kong, Jaws, and an angry T-Rex, and came off the better each time - what a rabbit! 2/27/98 - FRIDAY - We spent the day wandering around Hollywood today and were impressed by the kindness and generosity of people in California. We visited Mann's Chinese Theater where the stars are immortalized in cement (their hand and foot prints), and walked along the 'walk of fame' on Hollywood Boulevard finding the stars of our personal heroes. In the evening we went to a taping of 'Caroline in the City' (the sandwich episode), where the audience was supposed to be over eighteen but Gizmo got by security by wearing a false mustache. 2/28/98 - SATURDAY - Home at last! We finally made it back to New Jersey today after seven weeks of traveling and new experiences. Coming home to our own house and familiar surroundings has never been so sweet. We've had a great time travelling with Gizmo, seeing the world through his eyes and capturing it all in his journal. Thank you for including us as part of your project, we had a lot of fun and also have a record of our trip to cherish forever.